…still in progress. Think about lots of neon lamps used as electronic elements. 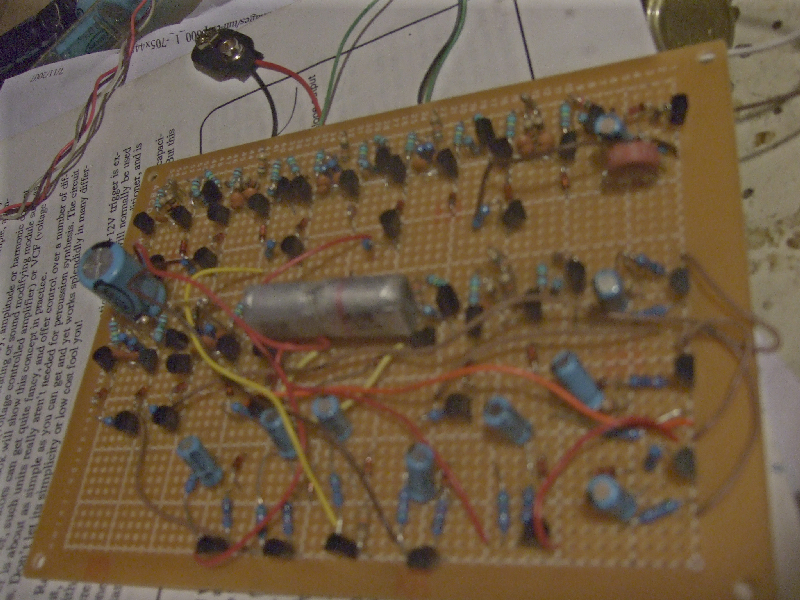 It outputs CV from the ribbon, which I use the M#@g CP-251 attenuator to tweak a bit. It works really well. For trigger, I use the audio out of the Persephone which works perfectly as well. Some drums, and some crappy pads in the background to form a point of reference for tuning. Note that this is my first two takes chopped up, and I am by no means a ribbon controller performer of any credibility. but I had fun. Daddy, what did “Electronic organ” mean in 1950? Thirty-six 6SN7s as oscillators and dividers. A 6L6 amp with a field-coil speaker. Total weight about 500 pounds. It may not look like much to you. But this is one of the first-ever products of the Fisher Radio Corporation, and is so rare that no hifi collector that I know has ever seen one–or even an ad or catalog listing for it. This particular one was found recently by John Eckland at a Palo Alto garage sale. Made circa 1953. It is a copy of the more-common HH Scott dynamic noise suppressor, made with miniature instead of octal tubes. The “Eye” tubes on each side of the panel display the operation of the bass and treble noise gates, respectively. There was a special amplifier for it, but John didn’t find the amp chassis. So he will pair it with the Fisher 60 triode amplifier seen in the 3rd photo, for some historical parity. Imagine a home hi-fi system using this stuff, plus a large rackmount preamp, perhaps a rack-mount REL Precedent FM tuner, and a Rek-O-Cut turntable with a GE variable-reluctance magnetic cartridge mounted on a massive Gray tonearm. All feeding a huge Altec Voice of the Theater horn speaker. 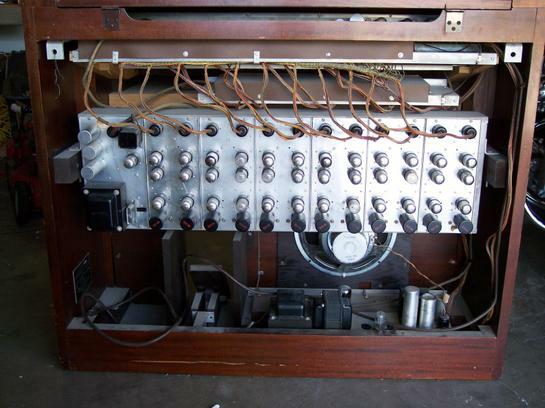 Top-end for 1953.
here’s a few photos of my modular synth taken sometime in 2005…. Thanks to Matrixsynth for the link. 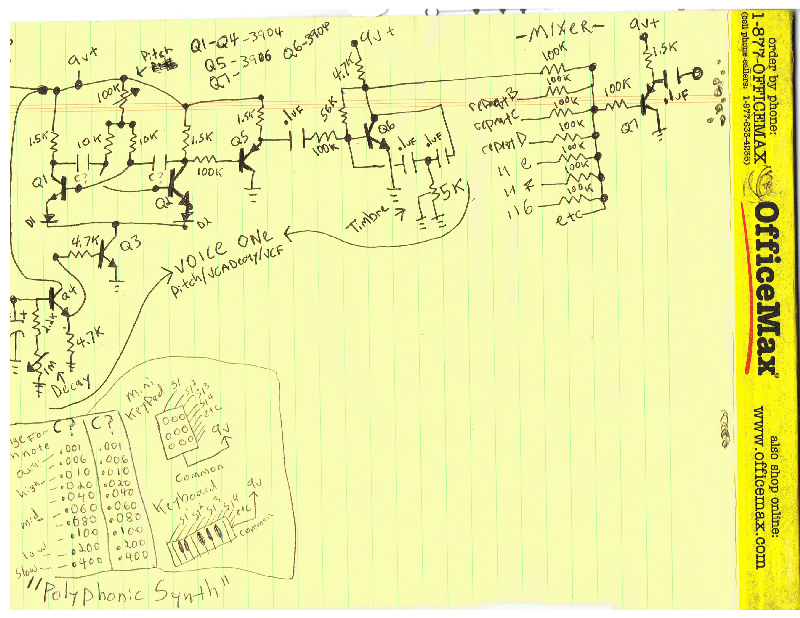 It looks like something Dr. Bohm made in the 1980s. They used to have a one-octave accompaniment keyboard like this, for attachment to organs. Oh, if only I could still buy a one-octave keyboard assembly. Civilization is slowly degrading.